What's it like being in costume? 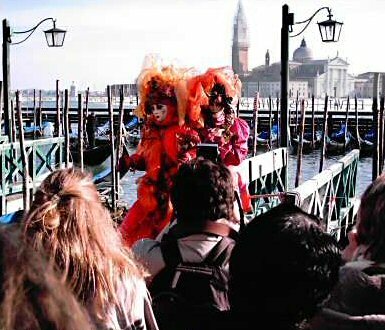 The moment you emerge from your hotel room, you become a photo opportunity for lots of tourists visiting the Venice Carnival. This might be a bit unsettling at first, but don't worry - it's not a bad thing. Here's what to expect. Lots of people don't dress up themselves, but come along just to see the people who do. If you're in full costume, there will be people coming from all directions, pointing cameras at you. This is strangely reassuring after a while, as when you take that first step in costume, you feel - well - rather uncertain as to whether you fit in. The truth is, you fit in no matter what you're wearing (because it's Carnevale and anything goes!). The majority of people - whether in costume or not - are engaged in the carnival atmosphere and plenty of them will enjoy taking your photo too. We got snapped the first time we stepped off the water bus, and the lady photographer made a nice comment about our costumes. We relaxed a fair bit after that, and the rest was plain sailing. A few years later, we tried the other side - being the photographers - but couldn't resist wearing masks with our normal clothes. We didn't get the crowds, but we were still stopped several times by photographers. There will be plenty of other people being photographed, so you'll by no means be alone. But because of the crowds that can form if you stay in the same place for too long, don't expect to sit quietly and admire the scenery. And when you're moving, don't expect to go anywhere fast. So leave some time aside in your trip for sightseeing, and do it in your normal clothes. While it is possible that the carnival will take place in the middle of a heatwave, it is fairly unlikely. Venice, being in the middle of the sea, attracts a cold sea breeze. Even if it's a sunny day, prepare as you would for a sunny February day in northern Europe. Warm clothing, extra layers and pre-planned coffee breaks are a good idea. You can experiment before you set out, to see what warm clothing you can hide underneath your costume. Possibilities include: a T-shirt, thin trousers, leggings and thick tights. But there's no substitute for checking the weather forecast before setting out for the day. It's worth checking the times of high tides too, since St Mark's Square often floods when the sea level rises too much (locals call this Acqua Alta). City officials can predict most floods 1-2 days in advance, and quickly install special raised walkways in St Marks Square to keep people moving. You can expect carnival events to be postponed or cancelled accordingly; but since flooding is so frequent, you can also expect things to get back to normal quickly afterwards.